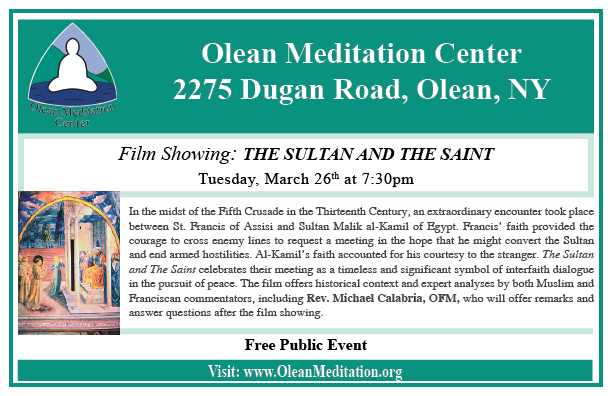 Tues., March 26, 7:30 p.m.
Francis’ faith provided both the courage to cross enemy lines to request a meeting in the hope that he might convert the Sultan and end armed hostilities. Al-Kamil’s faith accounted for his courtesy to the stranger. The Sultan and The Saint celebrates their meeting as a timeless and significant symbol of interfaith dialogue in the pursuit of peace. The film offers historical context and expert analyses by both Muslim and Franciscan commentators, including Rev. Michael Calabria, OFM, who will offer remarks and answer questions after the film showing.